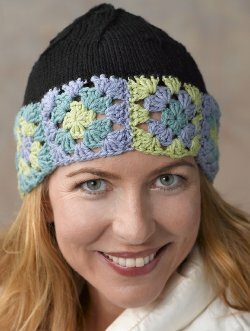 Make this unique nature hat for the next cold season from WEBS - America's Yarn Store. It combines knitting with crochet for that intriguing look. A crochet hook and knitting needles are needed. With CC1, ch4 and join with a sl st to form ring. Rnd 1: With CC1, ch3 (counts as first dc), [2dc, ch1] into center, *[3dc, ch1] into center; rep from * twice more, sl st into top of ch3, cut yarn and fasten off. Rnd 2: Join CC2 to any ch1 sp, ch3 (counts as first dc), [2dc, ch1, 3dc, ch1] into same sp, *[3dc, ch1] twice into next ch1 sp; rep from * twice more, sl st into top of ch3, cut yarn and fasten off. Rnd 3: Join CC3 to any ch1 corner sp, ch3 (counts as first dc), [2dc, ch1, 3dc, ch1] into same sp, *[3dc, ch1] into next ch1 sp, [3dc, ch1] twice into corner ch1 sp; rep from * twice more, sl st into top of ch3, cut yarn and fasten off. With CC2, ch4 and join with a sl st to form ring. Rnd 1: With CC2, as Rnd 1 of Square 1. Rnd 2: With CC3, as Rnd 2 of Square 1. Rnd 3: With CC1, as Rnd 3 of Square 1. With CC3, ch4 and join with a sl st to form ring. Rnd 1: With CC3, as Rnd 1 of Square 1. Rnd 2: With CC1, as Rnd 2 of Square 1. Rnd 3: With CC2, as Rnd 3 of Square 1. Sew or crochet squares together in a strip and block, then join in a ring to form brim. With MC and crochet hook, sc112 evenly around one edge of brim. With circular or double pointed needles, pick up and knit 1 st in each sc. Join in round. Knit every round until hat measures 5” from lower edge of granny square brim, or 3” less than desired length. Rnd 1: *K14, pm, rep from *. 8 markers placed. Rnd 2: *K to 2 sts before marker, k2tog; rep from *. 104 sts. Rep Rnds 2-3 until 8 sts remain. Cut yarn and draw through remaining sts. Pull yarn tight and weave in any loose ends.